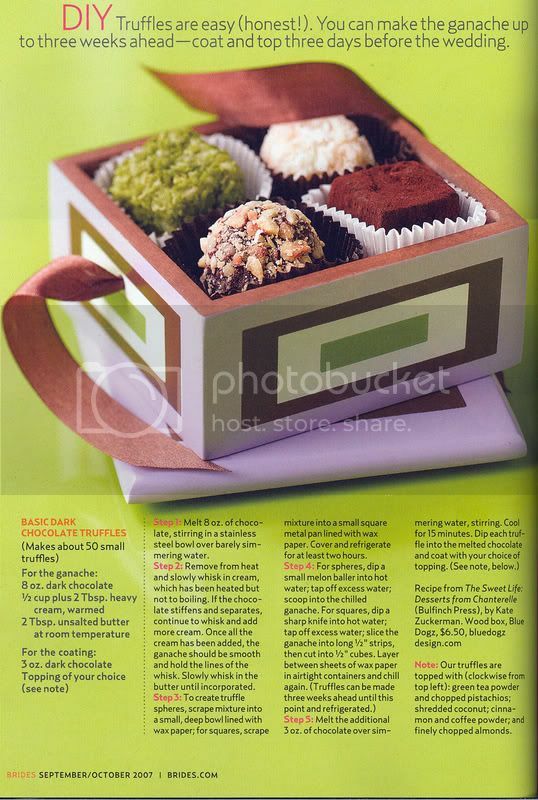 This article was published in October 2007 edition of Brides and I had to share with you. Click on the image to view the entire page. Who wouldn’t love to receive chocolate as a favor? Step 2: Remove from heat and slowly whisk in cream, which has been heated but not to boiling. If the chocolate stiffens and separates, continue to whisk and add more cream. Once all the cream has been added, the ganache should be smooth and hold the lines of the whisk. Slowly whisk in the butter until incorporated. Step 3: To create truffle spheres, scrape mixture into a small, deep bowl lined with wax paper, for squares, scrape mixture into a small square metal pan lined with wax paper. Cover and refrigerate for at least two hours. Step 4: For spheres, dip a small melon baller into hot water, tap off excess water, scoop into the chilled ganache. For squares, dip a sharp knife into hot water, tap off excess water, slice the ganache into 1/2″ strips then cut into 1/2″ cubes. Layer between sheets of wax paper in airtight containers and chill again. 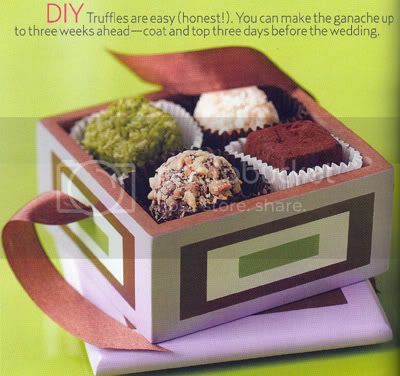 (Truffles can be made three weeks ahead until this point and refrigerated).